“What? You are dragging a guest for a hike? What if she doesn’t want to?” A friend of mine asked. Unfortunetly, or fortunetly depending on your point of view, my thoughts of “fun” revolve around outdoor activities, and if you are someone visiting me, I do hope you like spending time outside, too. ‘Cause whether you like it or not, I’ll be showing you around nature. 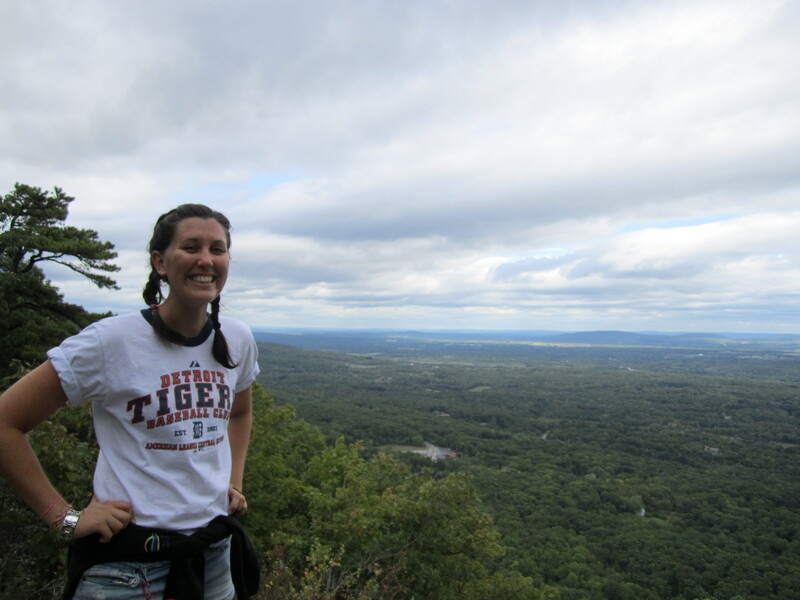 Yesterday I brought a visiting friend over to Mohonk Preserve to go for a hike. And, thankfully, she was a guest who enjoys being outside. I think I have mentioned the preserve in the past– it is a fabulous place for hiking, rock climbing, rock scrambling, and mountain biking. I think I put a link on my front page for the Mohonk Preserve. You can get a yearly membership for $55 which gives you unlimited access to the preserve and all the paths and hiking you want. Otherwise, I think for a day there you need to pay $12 (which is expensive for someone who is on a “money diet” after spending too much on an amazing bike). 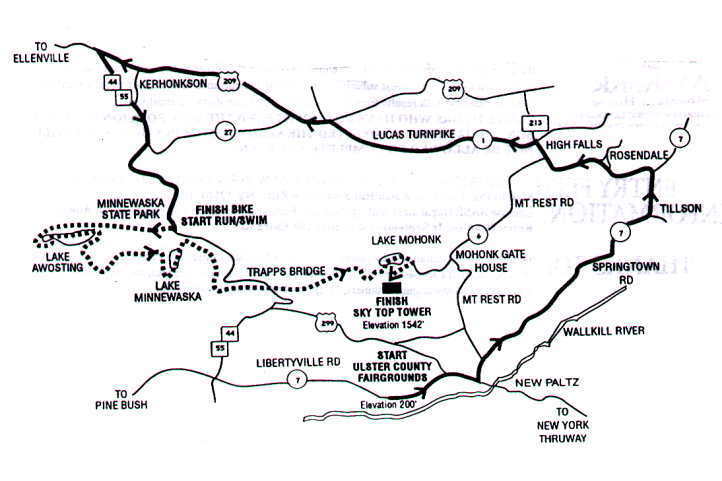 There are paths with different difficulties and of different lengths that can go into Lake Minnewaska State Park, or up to the Mohonk Mountain House, which has a great rock scramble to get to Sky Top Tower. If you are familiar with the New Paltz area, Sky Top Tower is the tower you see on the horizon, perched on the Gunks. It’s the “mascot” of New Paltz, if you will. The hike went quickly, and only one encounter with a non-poisonous snake. A nice feature of the Millbrook path is it’s stunning views of New Paltz and the valley–perfect for showing off the natural beauty of upstate New York to a visiting Australian. 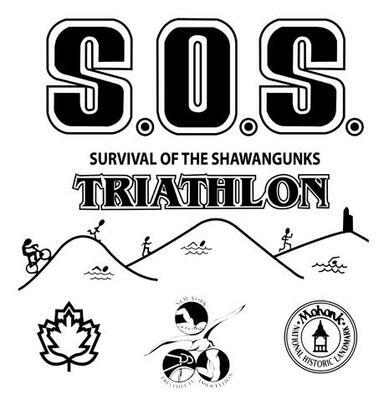 I could not help but notice bright pink signs with “S.O.S.” upon our return to the parking lot.No, they were not distress signs from Australians visiting the area, but signs for competitors in the well-known triathlon of the area– the Survival of the Shawangunks. The race is similar to XTerra races, if you are familiar with those; they are off road triathlons. The S.O.S. entails different stages of running, biking,and swimming– all in the ‘Gunks. It’s not a triathlon for the faint of heart, nor for beginners like me, who is still on Duathlon stages of racing. Ohh no no. Looks intense, huh? That’s because it is. Not as simple as the swim-bike-run of normal triathlon (not that those different stages of a race are simple, either). In S.O.S., the athlete bikes, then runs, then swims, then runs, then swims, then runs again, ending up at Sky Top Tower. While living in New Paltz, I did have the opportunity to meet some crazies who have completed the race–more than once –and they said it was amazing. I must admit I’ve studied the map and website for the race, gawking over the different stages, and give any athlete who has completed the race my utmost respect. If you are an experienced triathlete, perhaps consider the S.O.S.? A test of off-road endurance and strength.